Rainforest Trust Announcement — leilani.green - never underestimate a vegan hippie chick with a race car. July 6, 2018 (East Kalimatan, Indonesia) – Eleven years ago, biology graduate, race car driver and environmental activist Leilani Münter made the commitment to adopt an acre of rainforest for every race she runs. Today, Leilani is proud to announce that she has stepped up her rainforest commitment considerably for the eight races she is running in 2018 in the No. 20 Vegan Strong Toyota for Venturini Motorsports in the ARCA Racing Series. Leilani has partnered with Rainforest Trust to protect over 1,500 acres of rainforest, which will prevent over 60,000 metric tons of carbon from entering the atmosphere, equivalent to taking over 13,000 cars off the road for one year. With her donation Leilani is supporting a Rainforest Trust conservation project located along the Mahakam River on the island of Borneo in East Kalimatan, Indonesia. The river is home to a Critically Endangered population of Mahakam River Dolphin that consists of around 80 individuals. Researchers are in the process of analyzing the DNA of this isolated population and believe that it may be genetically distinct from other populations of Irrawaddy Dolphin, an Endangered cetacean that is typically found in coastal shallows throughout Southeast Asia. The area is also home to many other Endangered species including the Bornean Orangutan, Malaysian Giant Turtle, Proboscis Monkey and Storm’s Stork, as well as numerous threatened bird species. Leilani has plans to travel to Borneo to visit the area with Rainforest Trust. On July 12, Leilani will be at the United Nations in New York City to speak during The High Level Political Forum on Sustainable Development. She will be speaking about the human impact on our planet, biodiversity and wild animals. Her next ARCA race at Pocono Raceway is on Friday, July 27. The race airs live on FS1 at 4pm ET. 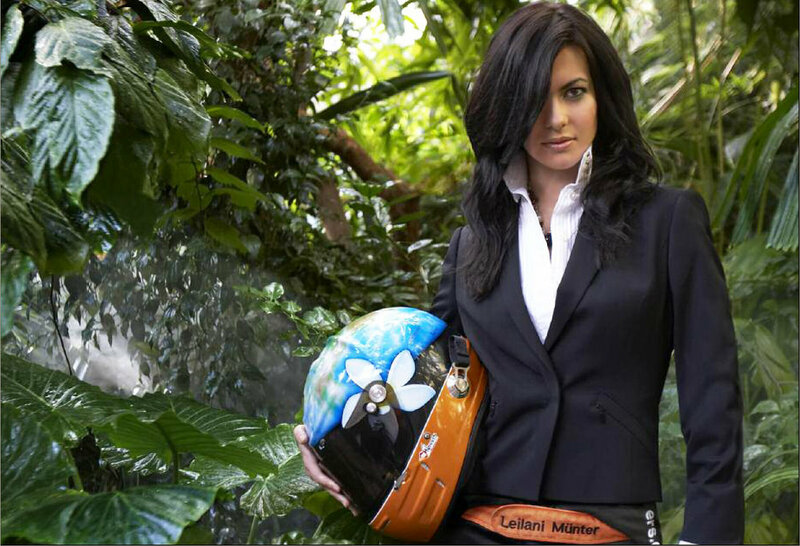 Leilani Münter is a biology graduate, race car driver and environmental activist. Discovery's Planet Green named her the #1 eco athlete in the world, ELLE Magazine awarded her their Genius Award, and Sports Illustrated named her one of the top ten female race car drivers in the world. In 57 starts Leilani has scored 9 top fives and 21 top ten finishes. Since 2007, Leilani has been adopting an acre of rainforest for every race she runs. She uses her race car to spread environmental awareness and animal rights among millions of race fans in the US. Leilani sits on the board of EARTHx Film, Empowered by Light, and the Oceanic Preservation Society, the Academy Award winning filmmakers behind The Cove. She is featured in their 2015 Emmy-nominated documentary Racing Extinction. Leilani is also a patron of Population Matters and an ambassador of Ric O’Barry’s Dolphin Project. Leilani is vegan, her personal car is an electric Tesla Model S which she charges with solar power. Leilani’s motto is: never underestimate a vegan hippie chick with a race car.